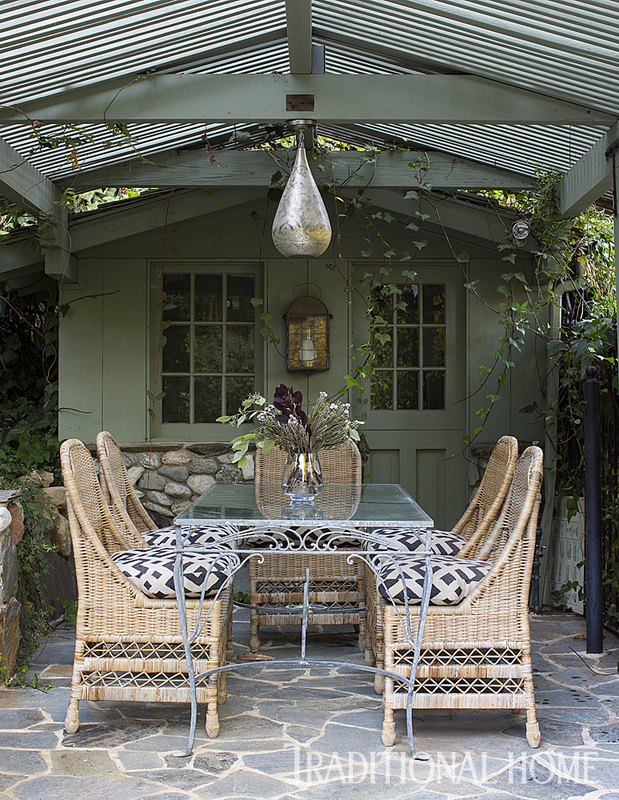 Designer Frances Merrill was excited to reinvent something other than a ubiquitous Spanish Revival style house, when clients hired her to rework their mock Tudor in Brentwood, California. The couple wanted a home with old-world charm designed to feel youthful and vibrant but not trendy— with baby-safe style. 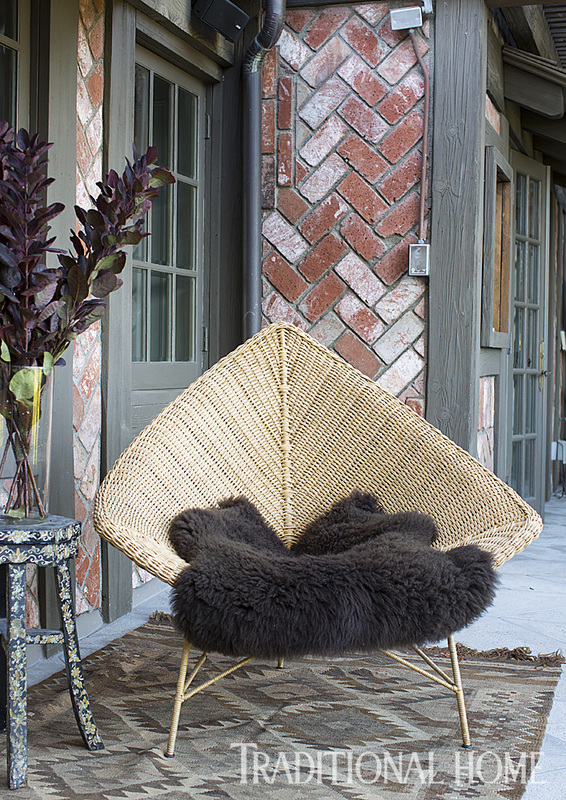 Merrill’s background working in Bangkok and on notable houses in Los Angeles made her the ideal designer. The light gray and white home office is a true escape, with floating feather wallpaper by Trove in New York. A vintage Swedish daybed from Eloquence, a marble desk from Obsolete, a desk lamp from Collected, and a beaded African foot- stool from the Pat McGann Gallery all add resting and working space options with little visual weight. 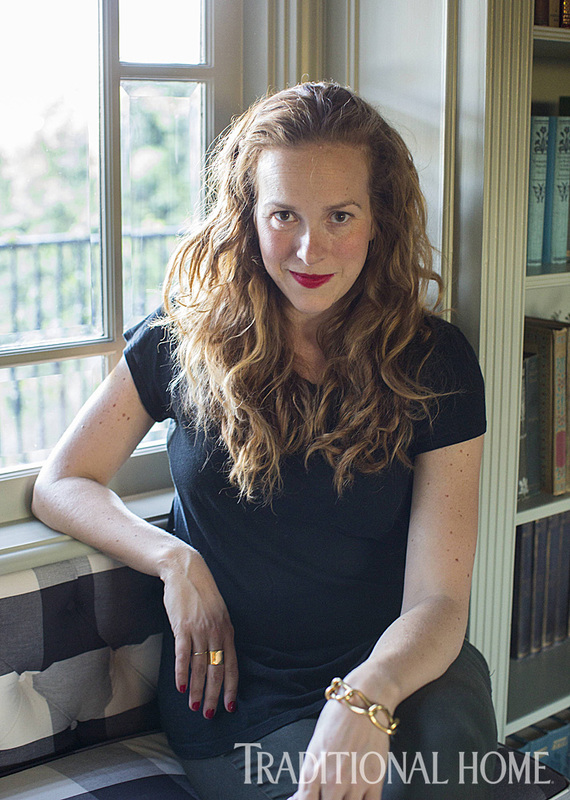 Merrill and her clients aimed to take the dated “country” out of the Tudor-style house and replace it with Bohemian cool. Their inspiration was Charleston—a country house in Sussex, England, used as an early- 20th-century gathering place for such Bloomsbury Group members as Virginia Woolf, Duncan Grant, and E.M. Forster. Sandblasted down to a soft wood finish, the floors, ceiling, and exposed beams harmonize with the “French Gray” Farrow & Ball paint on the walls. Windows are dressed with simple flat burlap shades “to take it down a notch,” says Merrill. 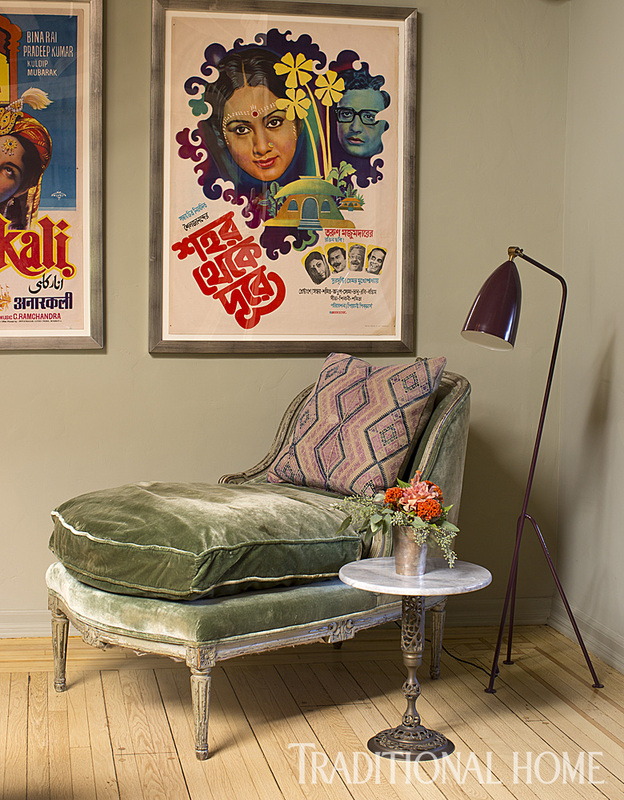 Adding quirky color and giving a nod to the homeowner’s Indian heritage, bright Bollywood posters feature the homeowners’ grandparents’ favorite movies. A clever teepee was added for quick toy stashing. 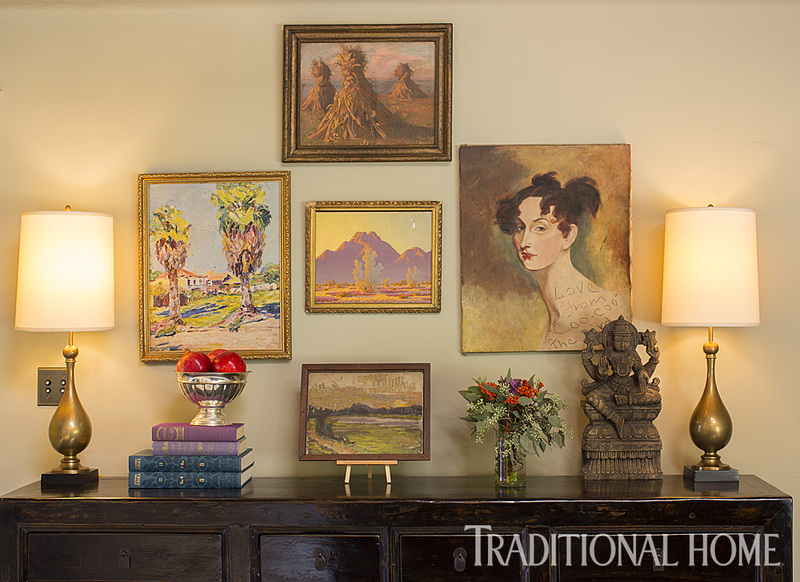 Paintings hung salon- style over a console table mingle easily with toys and texture. of seamless sophistication. The palette also includes the chalky wood tones of freshly sandblasted wide-plank floors, ceilings, beams, and reworked furnishings. 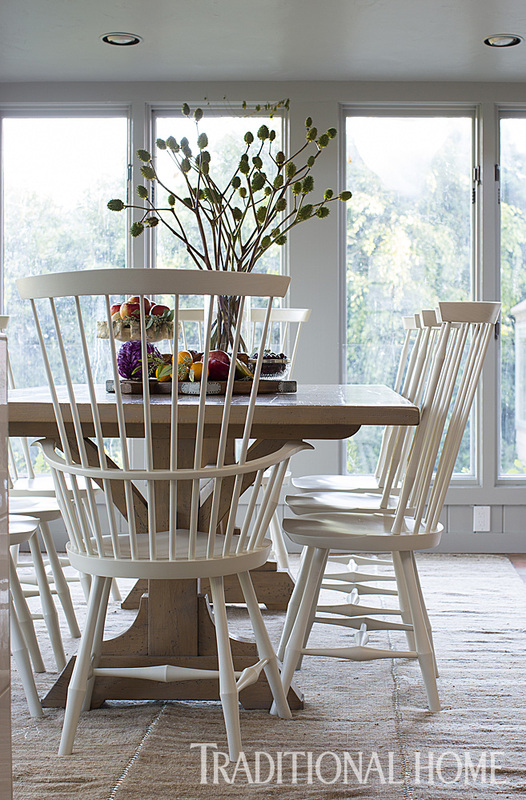 The breakfast table was custom-made through Mitchell Litt. Merrill had it sandblasted, then oiled for a custom natural finish. The chairs are large-scale takes on Windsor chairs, painted a custom white tint with a touch of pistachio green for a modern tweak. 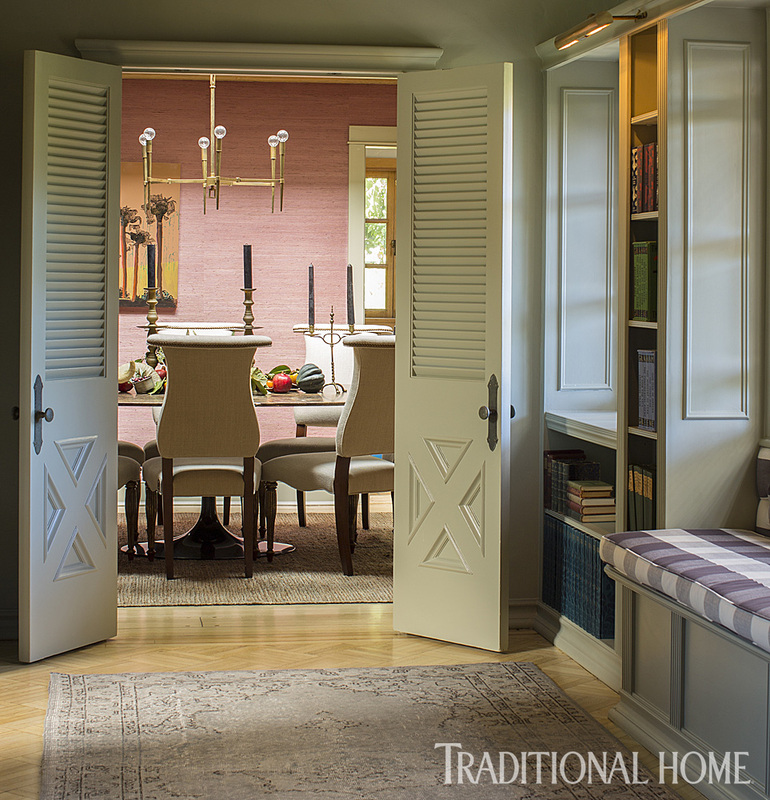 Complementing the gray-greens, muted plum and lilac are seen in the dining room’s sea grass wall covering, the master bedroom’s tartan bedding, and accessories throughout the house. 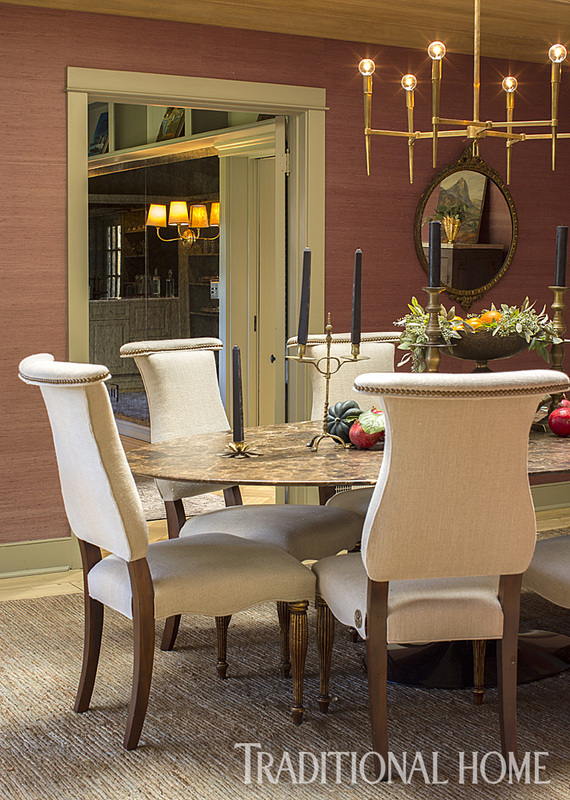 Raw finishes in high relief set the tone for comfortable dining. The soft harp-back (“A01”) dining chairs from Mitchell Litt are covered in a raw hemp for a nice contrast to the modern stone- topped Saarinen table. The wax-bloomed plum of the grass cloth wall covering complements the green-grays throughout the house. Low-sheen hammered tin provides a touch of soulful reflection in such key pieces as the twin round coffee tables in the living room and the headboard in the master bedroom. 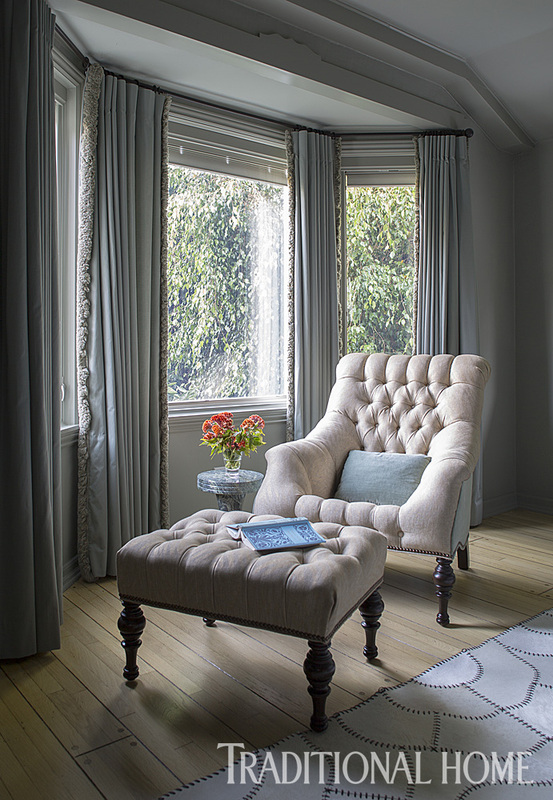 Ralph Lauren’s tartan shams and bedskirt combine with a pale charcoal duvet and tufted reading chair to give a British Colonial feel to the room. 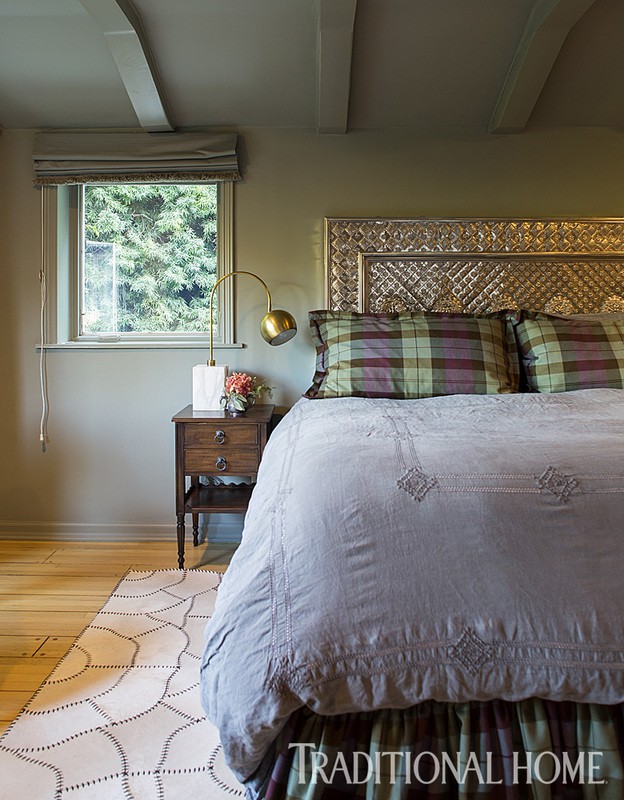 The hammered tin headboard from Casamidy highlights the dusky-toned bedding and walls. A patchwork hide rug from The Rug Company underpins the room with a note of handmade Bohemia. 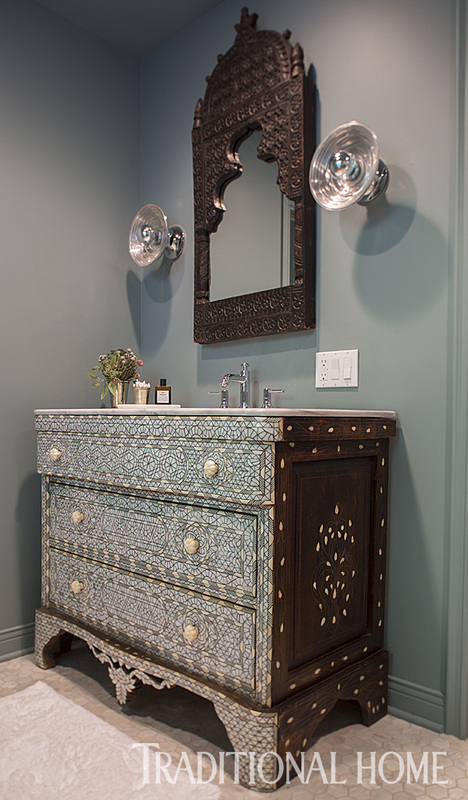 A Moroccan ivory and pearl inlayed commode-turned-sink catches the light brilliantly. Merrill added baby-appropriate accents. 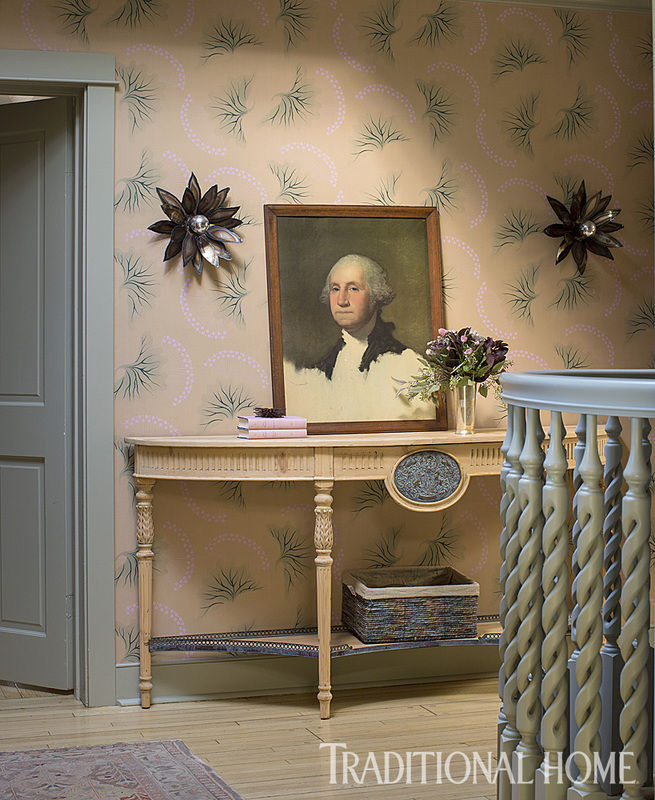 As an aesthete and a mother, Merrill created a space where stair balusters double as safety gates, hard edges are banished, and clutter can be easily contained. Whimsical wallpaper by British designer Neisha Crosland is an abstract pattern in “a soft green we could pull for everything else,” says Merrill. The sconces by Ames Ingham, a Los Angeles designer, flank a portrait of George Washington, and the new demilune table from Mitchell Litt was sandblasted and left raw. Making the most of the unusual octagonal paneled room, Merrill incorporated a handmade light fixture from Nickey Kehoe. Spun from varying shades of yarn, the fixture crowns the whimsical ceiling. 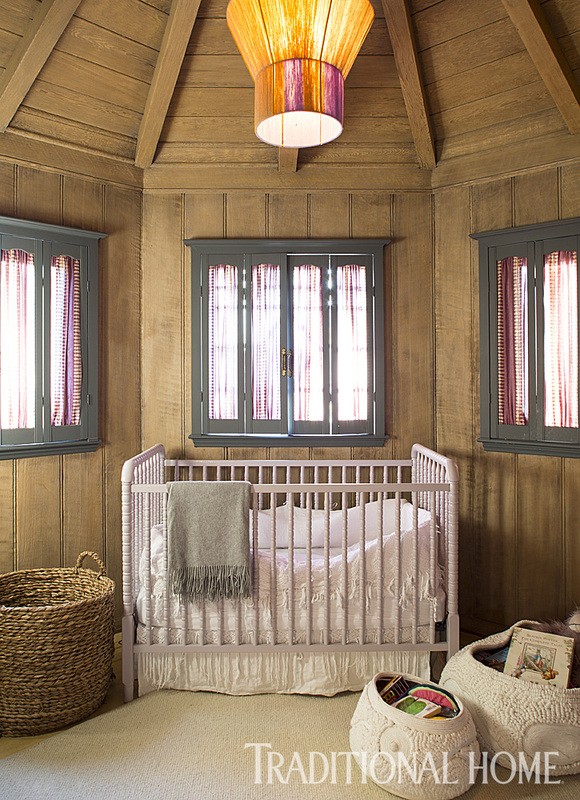 Merrill had the crib custom-painted in a fresh, nontoxic lavender. 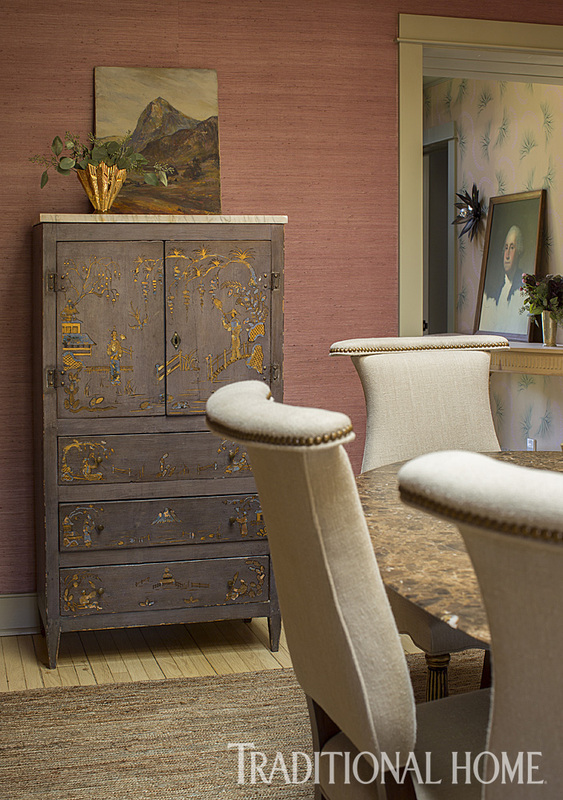 The lilac ikat window fabric from Peter Dunham Textiles spreads a rosy glow. 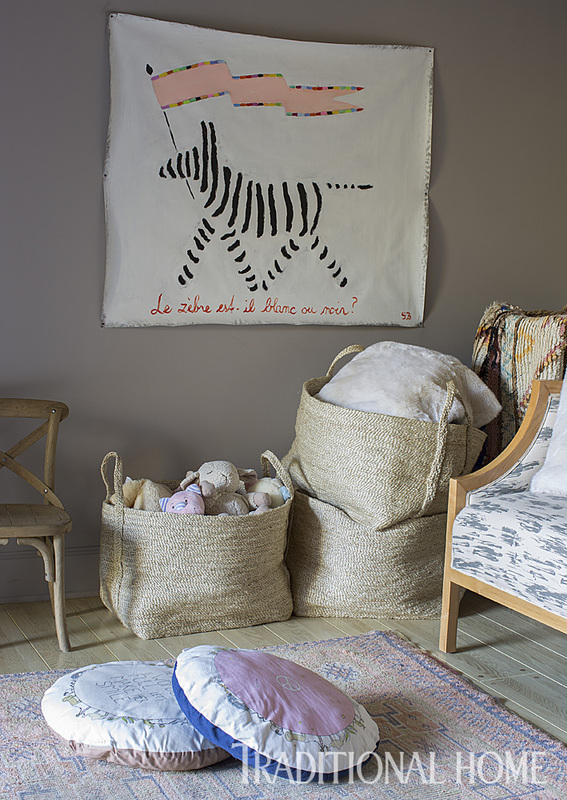 In this house filled with old and new furniture mingling with toys and texture, a modern-day Bloomsbury member would feel right at home here in Brentwood Bohemia. 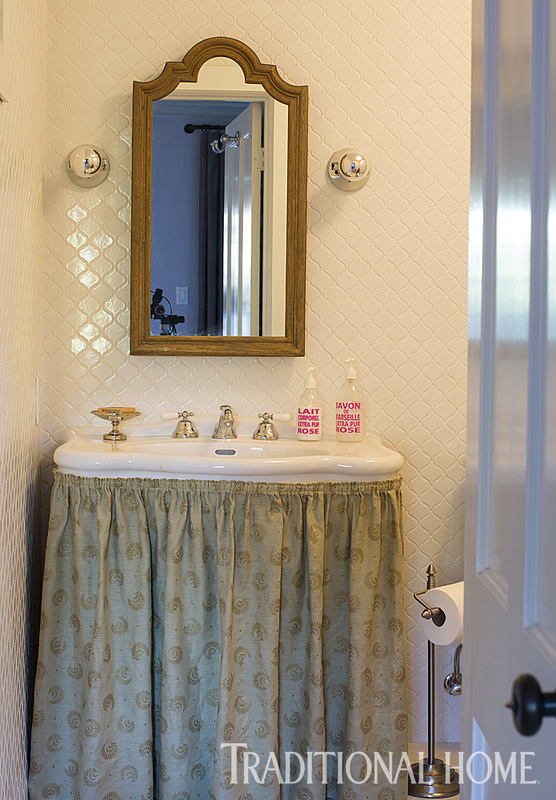 Opalescent tiled walls and a skirted vanity keep the childrens’ bathroom warm and whimsical. Sandblast your traditional pieces. It’s a great way to turn a traditional piece into something more interesting and sculptural. Hide the toys. 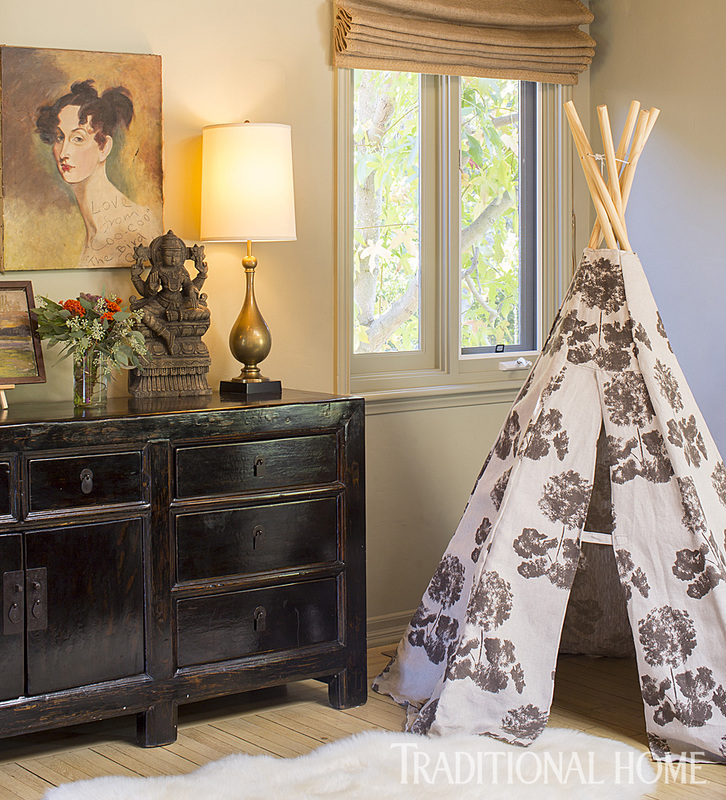 Easy-stash additions like a custom fabric teepee corral clutter creatively. Incorporate interesting materials. 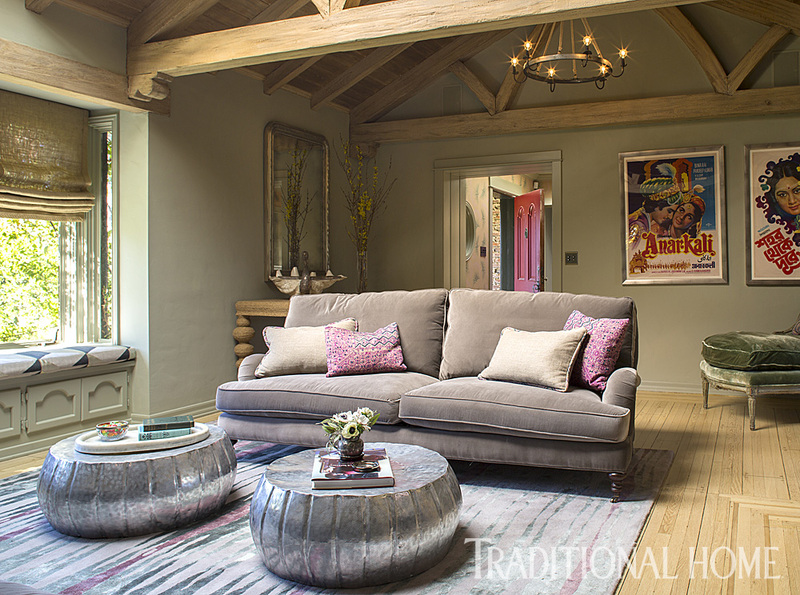 Hammered tin incorporates a primitive vibe, but it’s finished beautifully. Paint trim to match the wall. It inserts a nice modernity without looking stark. Use cool hues rather than yellow hues.They improve the look of a room and offer a better backdrop for your collections.